It is the first day of spring today. Of course, it does not feel like it at all. As if to prove it,it is also snowing in our neck of the woods. Hopefully pretty soon we will see some flowers peeking through, but until then my it has to be my spring ‘ flower ‘ chaat. I believe the word’ chaat’ comes from the word ‘ chatna’ or to taste in Hindi. It also derives from a Prakrit word, which reminds me of the sound our tongue makes with the roof of our mouths when we taste something savory, sweet and sour and ooh so yummy! Did you just try making the sound?…Yes , I know, I tried it too:) It is the sound we make when we can’t help ourselves eating noisily, enjoying every morsel! When I write the word Chaat in English, of course it reminds me of chatting with friends. To me this spring chaat is perfect for friends to gather around, chat and enjoy the chaat. The arrival of spring also reminds me that I have 10 pounds to lose. Yes, my four pounds to lose has turned into my 10 pounds to lose:( Why was it so super easy to gain those 10 pounds? But when it comes to losing the same 10 pounds, it will take me months or years of discipline, which I know I lack, especially when there is yummy food around. Can any of you relate to me? So my balance is yummy but healthy food. 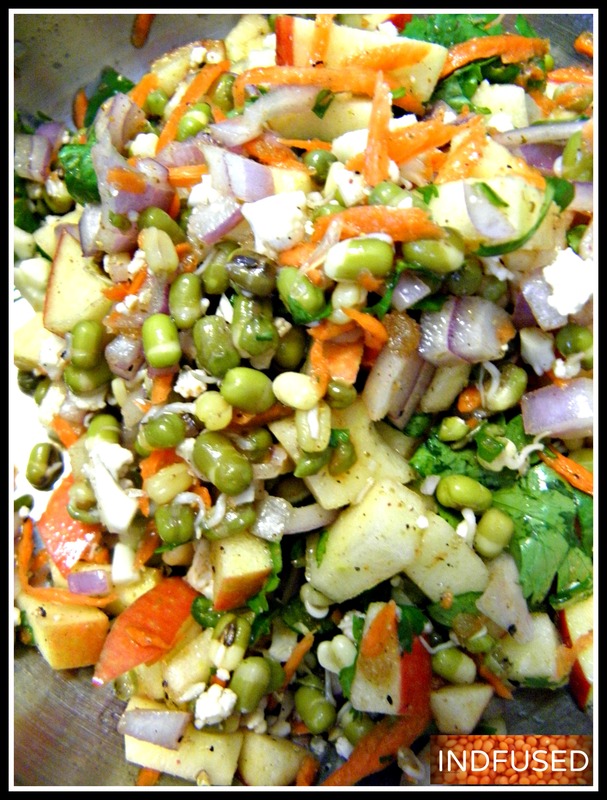 And when I think of healthy foods that I truly enjoy, this chaat is definitely one of them. This chaat is also 3 recipes in one-The super nutritious sprouted mung bean and raw cauliflower chaat can also be a healthy salad by itself and also tastes delicious combined with hummus in a wrap. I have simply combined my favorite raw veggies with sprouted mung beans and the crunchy sweet apple for a balance of taste and texture in creating this chaat recipe. Cook the mung beans + a pinch of sea salt in the microwave on high for 1 minute. Let it cool. Combine all the ingredients. 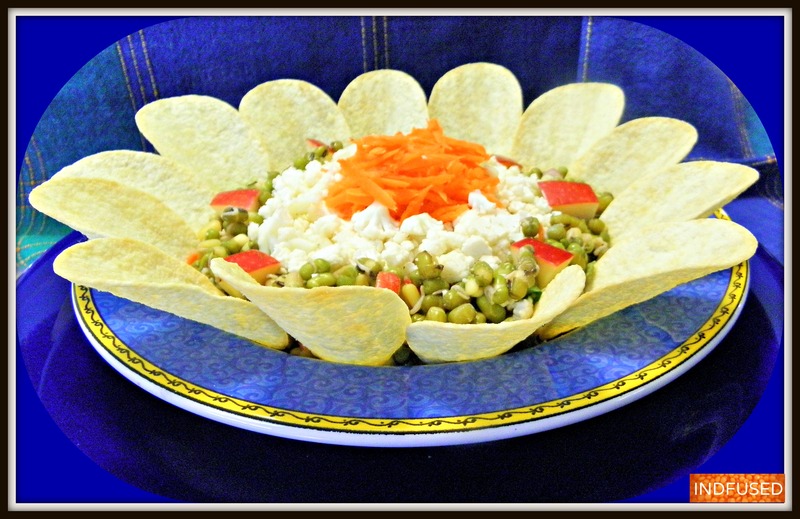 Toss and serve with chips! Enjoy the chaat with your friends this weekend! I am taking this Spring Chaat Angie’s Fiesta Friday party co- hosted by Tracy @Scratch It Cook and Nancy @Feasting With Thank you ladies for a super fun party! Lovely presentation and looks delicious! Good luck on losing the remaining pounds! Lovely chaat flower presentation. The ingredients look really great, and healthy to boot! We had snow here yesterday too, which is so uncommon in these parts. We all struggle to lose weight don’t we? I think the winter makes us hibernate and eat more. My secret lately? I’ve bought myself a digital weigh scale, and anytime I weight myself everyday. I keep within 1 or 2 lbs that way, and it is enough to keep me on track. I love chaat, but have never made it. This chaat does not have any of the fried sev, puris etc.. and did taste superb as a salad too. I am going to make it again for sure.The sprouted mung beans are nutritional powerhouses! I’ve been so intrigued by chaat. I first heard about it at our very own Fiesta Friday. There seem to be many varieties, but what’s the common thread? I still don’t have a feel for it. I do want to try this version of yours, though. Sounds like a refreshing salad! I was happy when I tried making this spring chaat because I could get the flavors of the chaat with out the chutneys and the sev. Yes I plan to make it often as a salad too. You are right Angie! There are so many varieties of chaat. It is a popular street food in India. 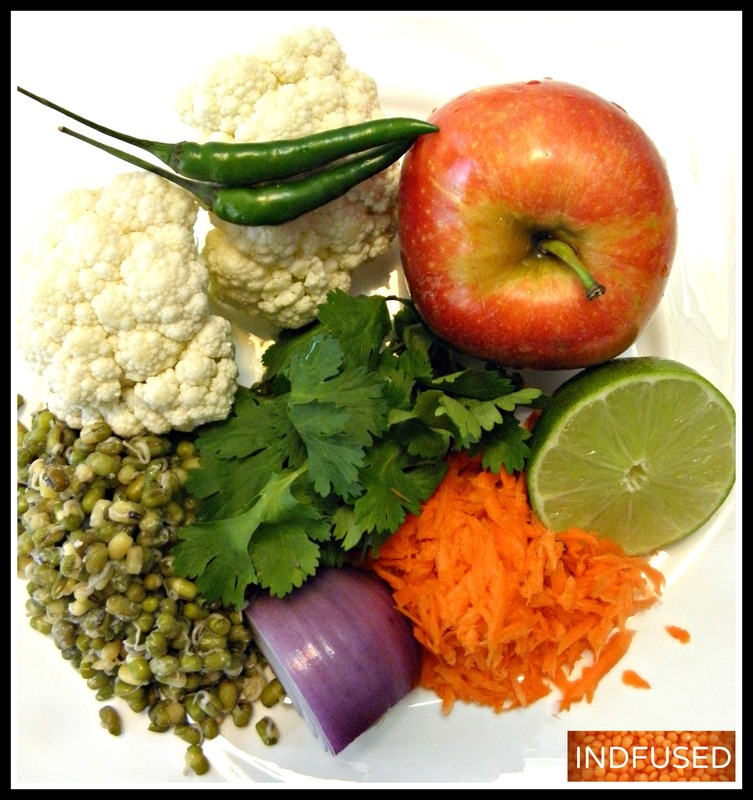 My take on this was to use cauliflower, sprouted mung beans ,apples and carrots to make it healthy. Also I was happy it tasted authentic without the two chutneys- so it is simple and easy to make too. This looks delicious! And with foods like this that are beautiful and healthy, you’ll totally shed those lbs! Thanks so much for sharing at FF! Sandhya, this is a great recipe! I made a slight variation of this today, and everyone loved it. I would usually just make a salad like this without cooking the mung, but cooking it a little made the taste better. Thank you! Thank you Pradnya! Yes cooking the mung just for a minute in the microwave, gives it a better flavor, I feel. Looks tasty and beautifully prepared!